Many articles published online as an Editor of MedGadget and CEO of the Journal of Young Investigators. Gaglani SM, De Obalida ME, Kominers SD, Li D, Suh CY. Success with Science: The Winners' Guide to High School Research. Research Corporation for Science Advancement (Tuscon, 2011). Book website. Gaglani SM, Kozak K, McKinnon K, Batt R, Bloxham J. "Undergraduate Science Experiences at Harvard College." Harvard Student Advisory Board for Science (SABS). Downloadable file below. "The Role of Cell Printing in Regenerative Medicine." Biomaterials Forum, second quarter, 2004. Pages 10 and 11. Gaglani SM. "Problem-Solving Skill Enhancement Through Chess." Chess Life. 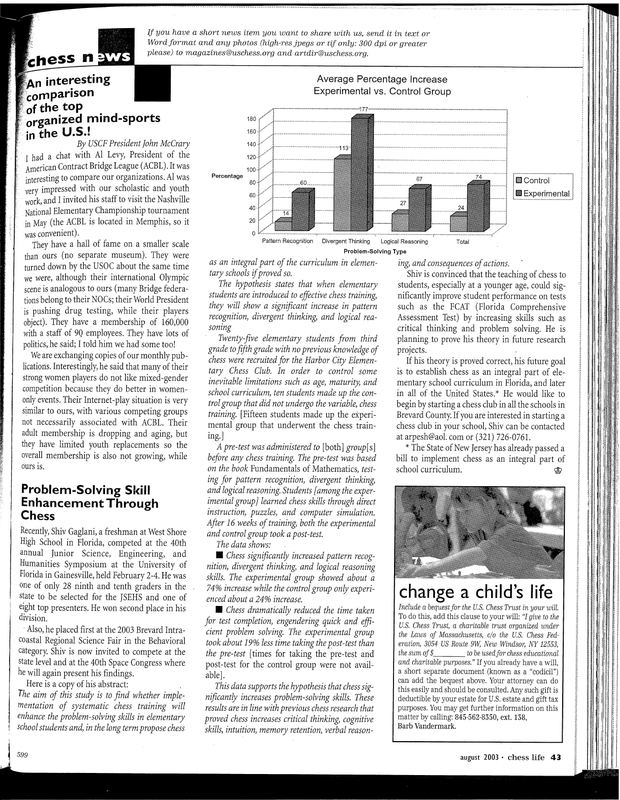 August 2003, page 43. Available here or in files at bottom of page. “Success with Science: A Peer-to-Peer Approach to High School Research.” Presented at the 2011 Intel Educator Academy in Los Angeles, CA. (http://www.successwithscience.org/the-body-economy.html; May 11, 2011; video below); the 2011 Society for Science & The Public (SSP) Fellows Program in Washington DC on July 29, 2011; and for the international Intel Engage Teacher community via Webinar on November 1, 2011. "Distribution of the Palmaris Longus Muscle." Presented at the Johns Hopkins School of Medicine to the 150-person Anatomy course in September 2011. Video below and presentation slides available here. "Gene Expression Profiling of the Developing Cortex and Striatum in Postnatal Mice." Presented at the 2009 Society for Neuroscience (SfN) Annual Meeting in Chicago, IL (Poster 811.8, pg 83; October 17-21, 2009). "Fabrication of Single Atom-Wide Nanowires for Applications In Quantum Computation." Presented at the 2008 Sigma Xi Annual Meeting & Student Research Conference in Washington DC on November 20-23, 2008 (see video below). Received "Superior Presentation" award. Also presented at the 2008 Rice Quantum Institute. Poster & Plenary Presentations at the 2007-2010 Harvard Undergraduate Research Symposia (HURS), 2009 Boston Undergraduate Research Symposium (BURS), and 2007 Program for Research in Science & Engineering (PRISE). Editor or co-editor of 2007 HURS & PRISE, 2008 HURS, and 2009 BURS Abstract Books. "Quantitative Trait Loci Modulate the Volume of the Cerebral Cortex." Presented at the 2006 American Academy of Neurology (AAN) 58th Annual Meeting in San Diego, CA from April 1-8, 2006. Success with Science: The Winners' Guide to High School Research (www.successwithscience.org).